Posted by Servo2Go.com in New Product Press Releases, News & Events. While the 2015 International CES and its exhibitors may think they own the Internet of Things (IoT) based on the recent fanfare, factory automation is among the many areas besides consumer electronics that is poised to benefit from the connectivity provided by the IoT (CES coverage on pages 4, 12 and 13). In fact, for factories other commonly used terms include smart factories, smart production, Industry 4.0, cyber physical systems (CPS) and more. Click on the link below and scroll to page 16 to read this complete article. Reprint of article from Robert Lipsett, Engineering Manager , Thomson Industries, Inc. The U.S. is a multi-lingual country, in its measurement units as well as its language. The rest of the world, however, uses one language for measurement, and that is metric. This makes the U.S. the only industrialized country that has not standardized on this system, even though it has had over 200 years in which to join the rest of the world. And this presents a few problems. For example, in 1999, NASA engineers launched their Mars Climate Orbiter, a $125 million spacecraft designed to explore the surface of the red planet. For nine months, engineers monitored the spacecraft’s flight and altered its trajectory as needed. The engineers knew that two crucial programs spoke in different units of measure, one in metric and the other in English units. And a simple conversion check was set up to ensure that the data from one program was compatible with the other. However, that simple conversion check was not done. It was overlooked. In calculating the thrust of rocket firings, engineers used feet per second. The spacecraft’s program, however, interpreted those instructions in the metric measure of thrust, Newtons per second. The difference between the two measures of unit is 4.4 feet per second. Therefore, each time engineers ordered a rocket firing, the spacecraft’s orbiting error increased, resulting in a critical problem – NASA lost the spacecraft. After months of analysis to determine what happened, engineers discovered the conversion problem and concluded that the Climate Orbiter either flew too low and crashed into the planet or it glanced off into outer space. Either way, they have not heard from it since. This is an example of what can happen when metric and English units are mixed without proper conversion. Click below to download this complete article. Looks like North America has once again become a prime location for manufacturing. 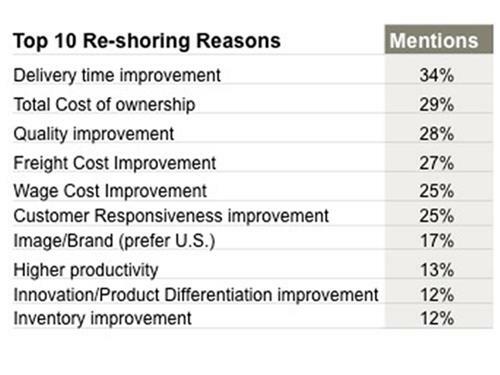 Researchers at A.T. Kearney have been studying reshoring and how it affects companies in all phases of decision making. The researchers have identified several forces that are driving companies to keep their manufacturing in North America or actually bring it back from Asia. The top reason is the time involved. Weeks of shipping means companies have to maintain additional inventory. Another factor is the cost of shipping. While domestic energy costs have come down in the US, the price of shipping is still high. Wages are also rising in Asia, plus the quality of goods produced in Asia has become an issue. All of these factors are making reshoring an attractive option for manufacturers, so the decision on whether to bring manufacturing back to the US after decades of producing goods in cheap-labor markets “is now beginning to loom large for US companies,” according to A.T. Kearney. Posted by Servo2Go.com in News & Events, Product Video's, Technical Support Information. Created by Electromate.com, this Technical Group strives to advance the knowledge of the fundamentals of Electro-mechanical Motion Control. We welcome regular posts by group members of any Technical Notes & White Papers, Video’s, Webinars, Podcasts, Engineering Formulae, Sizing Software, etc., related to the discipline of Motion Control. We appreciate your participation and encourage your comments. If you are novice or technically proficient user of Motion Control products/systems, please join this group. No Job Postings please. Click on the link below to join now. That it could comfortably place Dr. Cupples in a standing position leaving his arms free to perform surgical tasks. That the design was small and extremely mobile; specifically, that the device could “side-step” or move left or right. That the system be easily controlled via joystick. These requirements drove the University of Wisconsin team to utilize the unique properties of Mecanum wheels1 and to seek out Galil’s small, easy-to-use, and flexible DMC-4143 four-axis motion controller. The operator of SPOT will control the vehicle using a simple joystick. The joystick outputs two 0-5V analog signals proportional to how far the user is pushing the joystick either left-and-right and up-and-down. The analog signals are connected into two of the 8 available 12-bit analog inputs on the DMC motion controller. The DMC-4143 is programed to jog each of the four Mecanum wheels motors different directions and speeds depending on this simple operator input. The multithreaded capabilities of Galil’s products allow both analog signals to be read simultaneously allowing the jog speeds for each motor to be updated in ultra-tight loops. The team also utilized four of the 8 opto-isolated digital outputs to control the brakes. A single command, the BW (brake wait) command, is issued which automatically enables the brakes when the motors are turned off—an important safety requirement for the application. or their sponsorship page here http://www.fundly.com/uwbiomedicalengineeringdesign. Galil owes a special thanks to the University of Wisconsin Team for allowing us to be involved with their project to help get Dr. Cupples back in the ER. Thank you Professor Amit Nimunkar, Michael Konrath, Bret Olson, Justin Cacciatore, Blake Marzella, and James Madsen. ADVANCED Motion Controls, of Camarillo, CA USA expands it’s highly successful PCB mount, Z-drive servo amplifier family. New digital ‘DZ’ products are now available with higher power, greater thermal efficiency and lower operating voltages. Network choices, fast baud rates and multiple stand-alone command options greatly increase these servo drives’ capabilities for all torque, velocity and position mode applications. Designed to be completely compact, DZ’s take up little space, eliminate wiring hassle and still deliver unparalleled performance. Check out the newly expanded global standard in PCB mount servos drives – the fully digital DZ series! Considered µ-sized, DZ’s have an incredibly small footprint (smaller than a business card!) and weigh a mere 100 grams or less, including heat sink! All DZ’s can be configured to operate in torque, velocity (encoder or Hall) and position modes for brushed, voice coil or brushless motors. DZ’s have extremely high current loop bandwidth for quick response times as needed or when used in critical or demanding applications. DZ networks include CANopen or RS-232/485 (up to ~1 Mbaud!). Input commands can come over the network, such as PVT (position/velocity/time) or through direct inputs for: ±10V analog, Encoder Following, Step & Direction, PWM & Direction – to operate any mode. Some DZ’s capacity includes 10 – 80 Vdc operation while delivering 4 Amps continuous / 40 Amps peak. This provides up to 3 kW peak power when needed and can achieve up to 98% efficiency! DZ’s have an optional mounting card available for quick prototyping and documented interface reference designs for quick circuit integration. DZ’s common PCB pin out platform allows OEM’s to design to any power capacity but choose from the smallest power size to largest power size, everything from today’s available products to even higher powered future release versions! With multiple product choices, implementing DZ’s increased product functionality to meet many application needs will result in a dramatic reduction of system complexity. Yet, DZ’s are also cost-effective by themselves to further minimize overall system costs. As more applications require smaller mounting spaces or become completely mobile, designing with DZ’s would be the perfect match and choice. High power density, high operating efficiencies and low cost, what more could you ask for?